Today I went shopping with my mother at estate sales and garage sales. It is the first time since my teeth operation that I have done this and I had fun! First I shelled out 50 cents for the Melachrino Strings, "Music For Dining." Isn't that a wonderful picture? The Melachrino Strings had a whole series of mood music records going. Once for Christmas Howard gave me their "Music For Relaxation." I also bought a 10-incher by George Shearing. And Artie Shaw's "Moonglow" which my mother says she and her friends listened to over and over when it came out. A special score was a set of two six-inch MGM records of Lionel Barrymore in "A Christmas Carol." I will need something special to wear when I hold a dinner party where I can play "Music For Dining." So I spent $6 for two silk dresses trimmed with jewels. Here is one. All this got me in a Hollywood mood so I also bought an autographed picture of John Gilbert. It was supposed to have been $10 but because it was after 12 noon and the estate sale had dropped its prices, I got it for $5. At the bottom of the picture it says in white lettering, "Metro Goldwyn-Mayer." 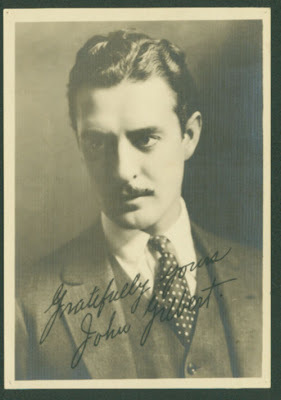 His autograph reads, "Yours truly, John Gilbert." My mother said, "How do you know that's an authentic signature?" I said, "Mom, who would fake John Gilbert's autograph?" I just do not think anybody would think of it! Here is something else funny. My mother did not know who John Gilbert was. I said, "Mom, he was before your time." 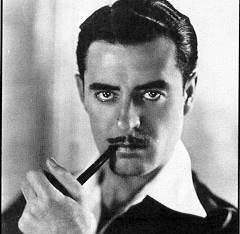 John Gilbert was called the Dark Star and people have said that he was Clark Gable before Clark Gable was. Here is another picture of John Gilbert I like. Here is a bit of a documentary on John Gilbert where you can glimpse him with Greta Garbo in "Fame Lost," then with Norma Shearer in "Romeo and Juliet." The "Romeo and Juliet" is a classic! It is the balcony scene with the Tchaikovsky music in the background. Leonard Pennario was at Norma Shearer's house once as will be divulged in my book. That was a very sweet story. Back to the documentary on Gilbert. They show Gilbert in "His Glorious Night," a performance they said was met with derision. I don't know why. I think his acting was good! He sounds intense and human. But I guess in the early days of talkies people had trouble accepting hearing actors talk when they were used to them being silent. That is what the film says. You also get to see the MGM lion roaring before the mic. Is that real? I will never be able to see that lion in a movie without thinking of that. Garbo loved John Gilbert and made MGM bring him back in "Queen Christina." I read that she and Gilbert were involved. It looks that way in this movie. She believed in him and as the narrator says, everyone could tell in that movie that Gilbert was a great actor. But it did not revive his career. Here is the complete Romeo and Juliet balcony scene. Watch till the end so you hear the director go, "OK -- cut!!" There is a comment on that clip from John Gilbert's grandson. That is touching. Here is a John Gilbert autograph I found on E-Bay that suggests that the signature I have is genuine. It looks just like it! This photo I just pictured is $50. Zut alors! Another is going for $75. Looks as if I made out like a bandit today. John Gilbert died at 36 and as someone in the documentary said, he found a beautiful place to go, up in the hills of Beverly Hills surrounded by very attractive women and numerous empty bottles. That is like me yesterday saying when it was my time to go I would like to have a glass of apricot champagne in one hand and red wine in the other. I guess he beat me to it! More cool finds. If you were ever to host one of those sales, I might have to visit Buffalo! John Gilbert was supposed to marry Garbo at a double wedding with director King Vidor but Garbo never showed up. Gilbert was distraught and L.B. Mayer said "just live with her" and Gilbert punched Mayer in the jaw hard enough to bring him to the ground. Thus was the beginning of the end of Gilbert's career. I was just watching the DVD of the documentary "When The Lion Roars" as well as reading a biography of Mayer, both of which talked about this incident.